Comments on various translations of the Bible and relation translation issues. This morning Dave Black posted some things about reading Hebrews from the Good News Bible (TEV) and also on authorship and canonicity. I’m not posting to enter into a debate on this point, but rather to note an attitude. The undeniable reality is that questions of canon and authorship matter. Of course, both sides demonize the other. Proponents of Pauline authorship are dismissed as obscurantists, while proponents of Hebrews’ non-Paulinity are accused of succumbing to the spirit of the age. But why should we tolerate this kind of judgmental divisiveness? Maybe we need another conference on campus to discuss the issue! Good points! I am deeply concerned when people who are treated with intolerance by one group, move to another, and then treat their former group with intolerance. Is there justification for some reaction? I know many people personally who have been treated badly and many of them have been deeply hurt. There’s some justification here for anger. I publish books by authors who have lost their jobs over theological positions. But is the justification enough? I don’t think so. Our response to intolerance needs to be greater tolerance. That doesn’t mean we have to accept and approve behavior. What it means is that we need to look for a freer exchange of ideas and better treatment of people. There are those who wonder why I publish a book like Dave’s The Authorship of Hebrews. Not only do I publish that book, but I requested it. Dave didn’t push it on me. I don’t accept Pauline authorship of Hebrews. I don’t believe we can know the author’s name with any confidence. Yet Dave’s work on this topic shifted my position from one that excluded Paul from the list of possible authors to accepting that his authorship is a possibility. More importantly, Dave demonstrates how to challenge an academic consensus—with detailed, careful scholarship. Now let me provide a contrast and a comparison. In the lower right of my little graphic today we have the cover for the forthcoming book from Dr. Herold Weiss, Meditations on the Letters of Paul, which I’m currently editing. First, the contrast. Contrary to Dave Black’s acceptance of Pauline authorship of Hebrews, not to mention the pastorals, Dr. Weiss accepts a minimal Pauline corpus. He even rejects Colossians. So his meditations are on a substantially smaller set of writings that Dr. Black’s would be. Now for the similarity: Besides the fact that I enjoy and have learned much from both writers and both books, neither of these men has ever asked me to accept something because it’s in their tradition, or just because they said so. They are both willing to debate and discuss. I can give you numerous reasons why I publish books from a variety of perspectives, and I’ve done so before. But there’s a personal reason. I like them and I benefit from them. I have published some books that I really wish had been better. I do not claim any sort of editorial infallibility. In fact, I would claim feet of clay. But I have learned from and benefitted by reading each and every book I have published. Let me suggest a response to Dave’s little book. How about looking at some of the vocabulary comparisons excluding the pastorals, or even working from a minimal Pauline corpus? I’d like to play with that. I don’t know if it would be meaningful, but somebody could look at it. When the e-mail arrived offering me a copy of this gorgeous Bible edition, I didn’t really read the material thoroughly enough or I might have declined. I’m a content man. I have one complete bookcase and parts of three more dedicated to Bibles. Very few of them are special in terms of their binding. It’s the text that drives me. But I saw that this was the New Living Translation, and that it was in a new edition, and so I said I’d review it. I’m actually glad I did. I’ve read a few of the other reviews, and they emphasize some simple facts about this Bible. It’s a work of art. Mine is goat skin for the cover, the paper and font are magnificent. It’s truly an heirloom Bible. You can find out all these details, however, from Amazon or from the publisher. I’m going to include some pictures in my review here on my blog so you can get an idea. Though it is an heirloom Bible it is not one of those huge books that are destined to stay on whatever table they’re placed on first. It’s easy to carry and to use. You can reference it, which is nice, considering it’s a reference edition. So while you may not feel like doing anything too vigorous around it, lest you damage the work of art, it is nonetheless quite useful as a reading or study Bible. Those who know me can predict where I’m going next. I’m afraid I have to admit that I start to twitch when I just hold this Bible. I didn’t actually look up the price before I received it, but within moments of actually putting my hands on it, I realized that it was a more costly Bible than I imagined. I’m not going to cite the price in my review, simply because current prices change. I’ll let you follow the link and get that information from the Amazon.com web site. I have never owned, and rarely touched or handled a Bible that costs this much. That leaves me with mixed emotions about it. But a book review should talk about the book from the point of view of what that book was written and/or designed for. I don’t criticize the NLT for not being either The Message or the NRSV. A Bible translation is designed for a purpose, and so is a Bible edition. You can decide what is right for you. If your plan is to buy an heirloom Bible that is to last and be passed on from generation to generation, you should be looking at this one. Did I meniont that this Bible is designed to last and to be passed down from generation to generation. In pursuit of that goal it has lovely presentation and family record pages as well. The text is, of course, the NLT. I have a high opinion of this translation for the appropriate audience. In one sense the NLT is descended from the Living Bible. One of the weakness of the Living Bible was that Kenneth Taylor didn’t read Hebrew or Greek. He worked from the English text of the American Standard Version. As a result, while the Living Bible was very readable, it was not always as accurate as it could have been. This problem was corrected for the NLT by a highly qualified evangelical translation committee. They managed to keep the readability, though I think they lost some of the charm and all of the eccentricity. How good that was is open to question. I have linked a couple of references to the NLT to my MyBibleVersion.com web site where you can get some additional information and see how I rate the translation in various categories. As I say on the cover of my own book What’s in a Version? the best Bible version is one you read. The first question should be whether you’ll be able to use and understand a Bible version. Accuracy in details is of no particular value if you don’t actually read and comprehend the accurate words. Of course, readability should not be an excuse for inaccuracy. Unfortunately, reviewers of Bible versions frequently call disagreements with their preferred translation of some particular verse “inaccurate,” when it is really just “different than I would have done.” The NLT may be different, but it is competently different. The things that stuck out for me in this edition are first things that are missing. This is not a study Bible in the sense of one with study notes, book introductions and so forth. I am pleased with that. Too many people are treating study notes as the inspired text and ignoring the actual text. You won’t do that here. You’ll need a good Bible handbook or Bible dictionary if you want to get that sort of information. What you do have is a single column that is a good width for rapid reading. I’ve discussed before many different approaches to reading, and I think one of the most neglected is sustained reading of quantities of the biblical text. This Bible will make that easy. I prefer that greatly to the multiple narrow columns that tend to slow me down. Further, there are quite a number of cross-references. It is possible to become dependent here, just as it is to become dependent on notes, but in this case I think most people can do with the help. The NLT translation notes are included at the bottom of each page. In the back you have a basic concordance and dictionary. This is not a replacement for your Bible dictionary but it will give you the basics and help you find a variety of references on a topic. This is followed by a selection of maps. Again, no effort is made to compete with your Bible atlas, but for reference on the run or in your study group, the material is better than average. While the binding, paper, and high quality construction are the distinctive features of this Bible edition, I found that it is fully valuable as a Bible for your actual use. If you do choose to spend the money on an heirloom Bible edition, and hope to pass it on to your children, this will fit the bill. With decent (though not massive) margins, you may also be able to leave your notes and your testimony in it for your children as well. I remain a content person, but I can respect a true work of publishing art when I see it, and this is one. Does the Bible need some improvements, if not in content, at least in presentation? That’s one way to put the question addressed by Rev. Steve Kindle in a guest post on Dr. Bob Cornwall’s blog. I want to make some fairly picky comments on this post. As I do so, I want you to be aware that I generally applaud the goals of this post, even while disagreeing in detail. My previous experience with prettying-up the Bible involves the violent passages. I previously reviewed Jack Blanco’s book (I have trouble calling it a translation), the Clear Word Bible. Some of his renderings are much more comfortable reading than the original, but I haven’t been able to conceive of a paradigm that would allow me to think of them as accurate. I often think, however, that some of the violent passages of scripture are saved from revision largely because so few people read them. Numbers 31 has the advantage of being in a portion of scripture rarely consulted by Christians. When they do consult it, they are often shocked and wish it would go away. Besides honesty (or accuracy), there is a problem with smoothing out the past. It conceals the nature of scripture, of the experience with God that comes from different people at different times. Seeing trajectories of change in scripture will change our approach to how we get from the words in the book to ethical action in our world. Rev. Kindle is primarily addressing gender language. This is a fairly controversial topic in modern Bible translation. Translations have been excluded from certain Christian book stores because of the way the represent gender. As is often the case, however, the issue was much more how one was perceived to represent gender. The same store carried other Bible translations that used gender neutral renderings. These other versions were simply less well-known. The Council on Biblical Manhood and Womanhood is very involved in these issues from a conservative point of view, and are opposed by the Christians for Biblical Equality. In perusing these sites, one can see that there is a great deal of weight put on these issues in church doctrine and politics. I am all for the use of gender neutral terms for God in all church settings including sermons, liturgies, and conversations. But when it comes to inclusive language in Bible translations, I must object. There is a valid distinction between those fields of endeavor. There is a great deal of difference between determining the way I will discuss God and the way I will translate. Do I refer to god solely with masculine pronouns? Do I avoid the use of pronouns at all? Those questions involve different issues when I am translating the apostle Paul, for example, as opposed to expressing my own theology. I am not a pastor, a liturgist, or a theologian. My studies were in biblical languages, and I’m a publisher. I’m interested in the words. And that’s where we tend to get into trouble. Most people, in my experience, view Bible translation as a singular effort, one with a definite, definable goal. I encounter this attitude almost every time I speak or teach or any other time someone manages to connect my face with my book, What’s in a Version?. The question I’m most often asked is: What is the best Bible version? Sometimes there’s a variant: What’s the most accurate Bible version? But those questions reflect the problem. 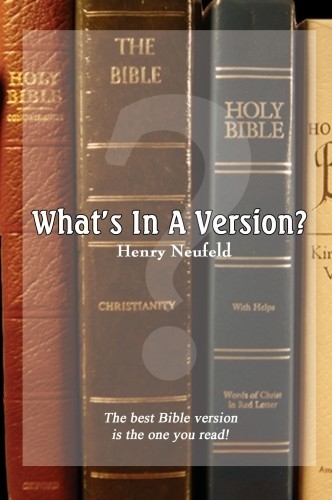 On the cover of my book I have a one-line answer: The best Bible version is the one you read! Surely that’s a horrible answer! There have to be bad Bible translations, and I could be reading one of them! And yes, it’s not a complete answer, yet it does make a point. The task of Bible translation is not singular. There is no one “most accurate” Bible translation. There is no single “most readable” translation. In order to answer that common question I have to know who the questioner is. What is the best Bible version for you? I also need to know the activity in view. What is the best Bible version for you to use for devotional reading? What is the best Bible version to use in your study group? What is the best Bible version to use from the pulpit? The reason is that one cannot transfer the entire meaning of a a source text into any target language. You are going to lose something. The question is what? Let me take a short digression here. When I discuss loss of meaning I do not mean solely between the text of the source language and the tip of the pen (or the little pixels on the computer screen) of the translator. I mean loss of meaning between what a well-qualified reader of the source language could get from the source text itself, and what a reader of the target language can get from the text in the target language. There is no great value in a text which is accurate in an abstract sense, but is not understood accurately by actual readers. It follows from this that a translation must consider who is to read the text in order to determine how to express thoughts from the source accurately. Further, understanding comes in different forms. Do I emotionally “get” the story told? Do I comprehend the facts that are narrated? Am I swept away by the literary beauty of the passage? Can I place myself in the shoes of those whose story is told, or who might have first heard the story? All of these things are desirable to various extents at various times, but successfully conveying them is not easy. In fact, it’s impossible to do everything at once. I cannot, for example, convey the rhetorical impact of the Greek of To The Hebrews while also making every point of theology clear to an American audience. I know readers will object that it is up to teachers and preachers to get the theology right, and they may be correct, but that is a choice in what will be translated. I could then say, “Translation X conveys the theology of Hebrews with great clarity, while translation Y gives one a feel for the literary tour-de-force executed by the author.” The author, however, was intending to convey his (or her, I must concede) theological points in a powerful and compelling exhortation. Where do I compromise? This is why some have commented on the irenic tone of my book. It’s not that I’m such a peaceable personality, or that I am a great peacemaker, though I would love to be. The reason is that I believe that there are many possible goals for Bible translation and that there are many audiences for which one might translate. Thus there are many possible ways in which one can (and should) translate, so I have less of a tendency to condemn any particular rendering. I do not mean that all translations are equal. I do not mean that there are no wrong translations. I simply mean that there are multiple right translations within various parameters. I am disturbed when I hear preachers and teachers refer to translations that are supported by significant numbers of scholars as “mistaken” or just as “errors in translation.” This presents the task of translation as too simple. There are many legitimate disagreements which should be referenced as such. Reserve the word “error” for a translation that cannot be justified. In this case I would disagree with the usage in either case. The Greek word adelphos or its plural adelphoi may have as its referent either a male person (or group of males, as appropriate), or a person of undefined gender, or a group of both men and women. It is probably significant that the masculine form was used in both cases, though it is very easy to take grammatical gender too far in translating a language in which grammatical and natural gender do not match. Similarly, until recently (change is still in progress) we used “he” to refer to a generic person in English, and “men” and “brethren” to refer to groups of mixed gender. In groups I have been able to survey informally, there seems to be a break right around 40 years of age (adjusted for the passage of time) as to how this usage is understood. Older people will understand “brethren” as including both genders when a group is addressed, while younger ones do not. A pastor illustrated this to me very clearly when he objected to the NRSV because of its gender neutral language. He couldn’t see how “brothers and sisters” was an accurate translation of adelphoi, so he would stick to the more accurate (in his view) RSV. The next Sunday he was reading scripture and he came to a passage in Paul where the apostle was clearly addressing an entire congregation. He stopped, looked up, and said, “And that includes you sisters too!” Clearly he knew some in his congregation would not hear the passage as inclusively as it was intended. My brothers and sisters, believers in our glorious Lord Jesus Christ must not show favoritism (James 2:1, NIV, from #BibleGateway). Not many of you should become teachers, my fellow believers, because you know that we who teach will be judged more strictly (James 3:1, NIV, from #BibleGateway). This is different, however, from the kind of effort made by The Inclusive Bible, which changes many cases in which the original intent of the passage, by which I mean in this case the original referent, is not inclusive. The passage Rev. Kindle quotes from 1 Corinthians 14:34-35, for example, if it is original to the epistle (I believe, with Gordon Fee, that it is not), certainly is not intended as inclusive. That case is very different from either of the cases I referenced in the book of James. These cases should be handled differently, according to the nature of the audience and the usage in the target language. Right now we are somewhat in transition on inclusive language in English, and that will complicate the work of the translator, and even the liturgist. Something that is heard one way by part of the congregation may be heard in the opposite way by another. In addition, we need to recognize multiple goals in the use of our ancient texts. We do not translate just to convey data. We also translate for liturgy, for devotion, for prayer, for meditation, and for other goals. The particular way we handle the material at hand must take this different uses into consideration. There are certainly illegitimate translations (1 Corinthians 14:34-35 above from The Inclusive Bible, and many Old Testament passages from The Clear Word, for example) but there are also multiple legitimate goals and multiple audiences to which the translator will hope to convey something of the source text. John Byron comments on a web site that makes that suggestion. One of the champions of this bizarre position, Peter Ruckman, preaches just down the road. There’s a very brief summary on The Good Book blog, For and Against: The Majority Text Approach to Textual Criticism. I agree that the Byzantine needs to be given more consideration, though I support an eclectic approach. Bible Gateway has added the RSV and NRSV. This will be useful for me as these are my two favorite formal equivalent translations. This addition comes by agreement with the National Council of Churches.